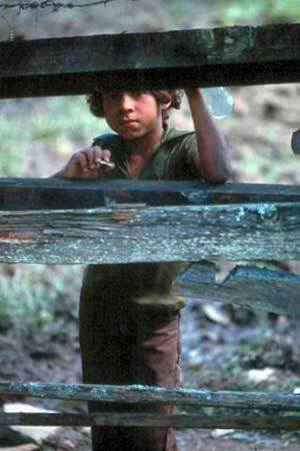 A central cause of the recent dramatic increase in the number of unaccompanied children immigrating into the U.S. through its border with Mexico is the high level of crime and violence in the principal “sending countries” – Honduras, Guatemala, El Salvador (collectively referred to as the Northern Triangle) and Mexico (see related article here). Yet neighboring Nicaragua, with the lowest per capita GDP in the region, has been able to maintain markedly lower levels of violence. While the specific history of Nicaragua has much to do with the lack of violence, its police system, dubbed “a new security paradigm” by some, could offer ways forward for its more violent neighbors. The high rates of violence in the Northern Triangle were created in part by U.S. immigration policy. In 1996, President Bill Clinton signed the “Illegal Immigration Reform and Immigrant Responsibility Act,” which militarized the U.S.-Mexico border and expanded the list of crimes for which immigrants could be deported. Perhaps the most significant impact of this policy change was that thousands of Central American youth who had become involved in gangs, especially in Los Angeles, were deported to their home countries. On arrival, without any sources of support, they sought each other out and re-formed their gangs, now on an international level, beginning the reign of mega-gangs like Mara Salvatrucha and Mara 18 that continue to wreak havoc in the Northern Triangle. As few Nicaraguans were living in Los Angeles (they tend to concentrate in Miami and Northern California), Nicaragua did not experience the same influx of gang members. Another important factor for lower rates of violence in Nicaragua has been its successful anti-crime policies that include community policing, neighborhood watch groups and identifying and helping at-risk youth. When the Sandinistas took power in Nicaragua in 1979, they cleaned out the police forces, removing large numbers of corrupt officials and changing their orientation from that of repression to working together with community groups; the same never happened in the countries of the Northern Triangle where revolutionary struggles were unsuccessful. While the peace accords in El Salvador and Guatemala called for cleaning up and modernizing the police forces, this never happened on a significant scale. As a result, police forces in these countries are not trusted, and are often feared by the population. While Nicaragua’s national police director, Aminta Granera, is a popular public figure with approval ratings near 80 percent, in Guatemala only 15 percent of the population have “some” or “a lot” of confidence in their police forces. In Honduras, people have come to refer to the security forces as “insecurity” forces due to their high levels of corruption and unnecessary violence perpetrated by them. National police chief Granera describes perhaps the key reason why they have been so successful: “Our policing model is a model that is preventative, proactive, communitarian, deeply rooted in the heart of the community, and I think that that is its greatest strength, and that is what makes the difference.” Unfortunately, governments in the Northern Triangle have not yet tried this new approach in their own countries. Guatemala and El Salvador have recently decided to further entrench their failed repressive police system while Honduran security forces continue to target not only at-risk youth, but also members of social movements, for violent repression.